The Musical Instrument Museum also known as the MIM provides a unique experience enjoyed by visitors of all ages. With over 6,800 instruments and objects on display, MIM showcases music and cultures from every country in the world through engaging exhibits. Spend your time traveling the world through music in major Geographic Galleries using state-of-the-art equipment. Celebrate some of music’s favorite performers including Elvis Presley, Taylor Swift, Maroon 5, and more. Finally, make some music of your own in the Experience Gallery. At MIM, you will be entertained, engaged, and inspired. If you enjoy music, you will love MIM. This top-rated attraction in Phoenix is the world's only global musical instrument museum, the MIM offers a fun, one-of-a-kind experience to be enjoyed by guests of all ages. With more than 6,500 musical instruments and objects on display in delightful, eye-catching exhibits, MIM showcases music from every country in the world. 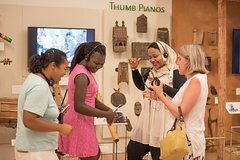 The museum’s self-guided tour features state-of-the-art audio and video equipment, enabling guests to hear, see, and feel the creative spirit of people as they make music across the globe. The two-story museum structure evokes the topography of the Southwest, suggests the museum’s international scope, and expresses the universal role of music across all cultures. Desert plantings and arroyo environments surround the museum, creating a serene and welcoming oasis. Start your tour in the Orientation Gallery, which introduces guests to the rich diversity of instruments. MIM is interactive. Guests can immerse themselves in the museum’s automatically activated displays and travel the world through Geographic Galleries that feature Africa, the Middle East, Asia, Oceania, Europe, and Latin America and the Caribbean. In the United States / Canada Gallery, instruments are organized by themes such as musical genres. Check out the Mechanical Music Gallery, where guests can watch and listen to the twenty-five-foot-wide Orchestrion. Be inspired by favorite musicians in the Artist Gallery and get a close-up look at their instruments and stage outfits. Or make a little music of your own in the Experience Gallery where you can bang a gong, strum a harp, and play unique instruments from around the world. At MIM, you will be entertained, engaged, and inspired. If you like music, you will love MIM. MIM is open daily from 9 AM to 5 PM. Last admittance is 4 PM. Closed Thanksgiving Day. MIM is family- and stroller-friendly and offers complimentary wheelchairs. Parking is free. A headset and guidePORT are included with each admission.